As a child, I would often look at the toy section in my mother’s department store catalogs and I would imagine playing with the toys I would see in the pictures. As an adult, I still enjoy looking through a catalog; however, the toys have changed. Now I like to browse through electronics such as TVs, computer devices, and audio devices. With current technology, I can look at catalog items on my computer and, if I provide a credit card number, I can purchase an item directly from the catalog with the click of a button. 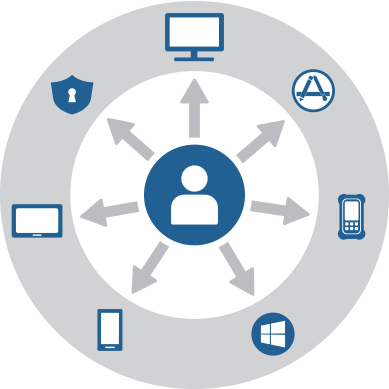 When consumers purchase an item directly from an internet site, a process is executed by the internet vendor. Usually, that process will authorize the purchase, verify the inventory, procure the item, provide information to a third party company for shipping and provide a status update via email to the customer. During the first decade of the internet, companies became victims of their own success as they struggled to properly manage their inventory supplies. As integration between consumer internet sites and their inventory management systems improved, customer expectations were properly set. Companies that did not address inventory integration issues often missed shipping deadlines which caused items to arrive late. This caused a lot of stress for the consumer purchasing for the holidays, birthdays, or anniversaries. As a result, many companies lost credibility with their customers which opened the door for their competitors. IT departments in many organizations are creating self-service portals with catalog items containing IT assets that employees need to do their jobs. For example, phones, laptops, tablets and software licenses are often available through online automated employee request portals. ITSM tools, including processes and catalog services, are often used to build employee self-service portals. Much like consumer internet sites, inventory management plays an important role when fulfilling employee requests for IT assets. (Service Operation) The process responsible for managing the lifecycle of all service requests. (Service Design) A database or structured document with information about all live IT services, including those available for deployment. The Service Catalogue is the only part of the service portfolio published to customers, and is used to support the sale and delivery of IT services. The Service Catalogue includes information about deliverables, prices, contact points, ordering and request processes. See Contract Portfolio. Request Fulfilment processes, along with Service Catalog, are becoming more recognized as a way to cut IT costs. Although there are some differences between ITIL definitions and some analyst’s definition of a Service Catalog, ITSM vendors and their customers are learning they can provide most IT requests through the Service Catalog, including requests for hardware devices. When adding IT assets to your Service Catalog using an automated request fulfilment process, ITAM integration should be integrated into the process so that assets can be tracked. Much like making any online purchase, an approval process would need to be included. For example, a request for a laptop would need to be approved by the manager whose department will be charged. Upon approval, the process would need to check current inventory in the ITAM database to verify whether or not a laptop is available. 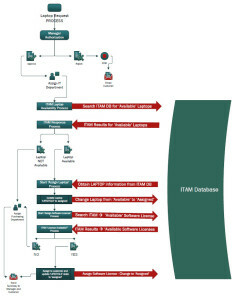 The ITAM database should contain a lifecycle attribute for all its inventory. Laptops that are not in use would be set to ‘available’ for procurement. This information would be passed to the ITSM request fulfillment process via a connector or an API. If a laptop is available, the process would then reassign the available laptop to the customer who made the request. The lifecycle of the laptop would then be updated to show it has been assigned and no longer ‘available’. If a laptop is not available, the process should reassign the request to the purchasing department so that a purchase order for a laptop is issued to the vendor. A status update should then be sent to the customer who initiated the request to set proper expectations for delivery. Additional assets such as software licenses or user accounts might be required for an asset that is requested. These dependent assets should be added to the request fulfilment process. For example, if you know a laptop will require a software license for Microsoft Office, you should build that software asset request into the laptop request process. 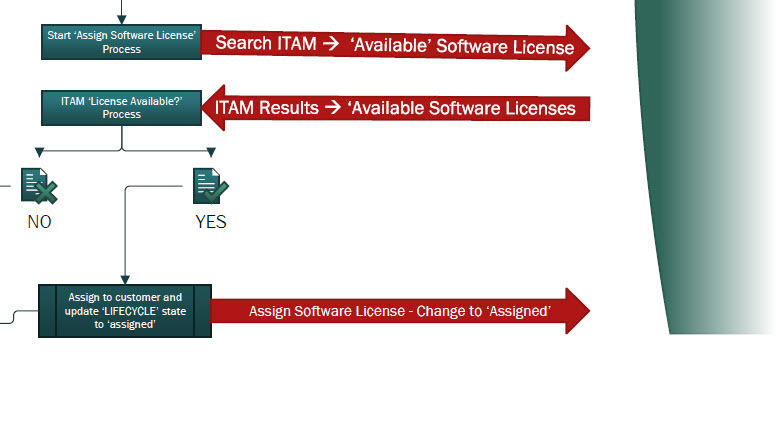 If the ITAM database manages software license information, have the process check for available licenses, then assign the software license to the customer requesting the laptop. Unlike hardware, software can be assigned even though licenses are not available; however, the process should notify the purchasing department so that the license can be purchased. Losing track of your installed software licenses can be costly if, during a software audit, it is found that you do not own enough licenses. 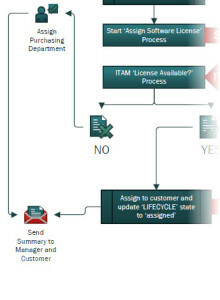 Suggestion: Initiate changes to the ITAM lifecycle attributes from ITSM processes. 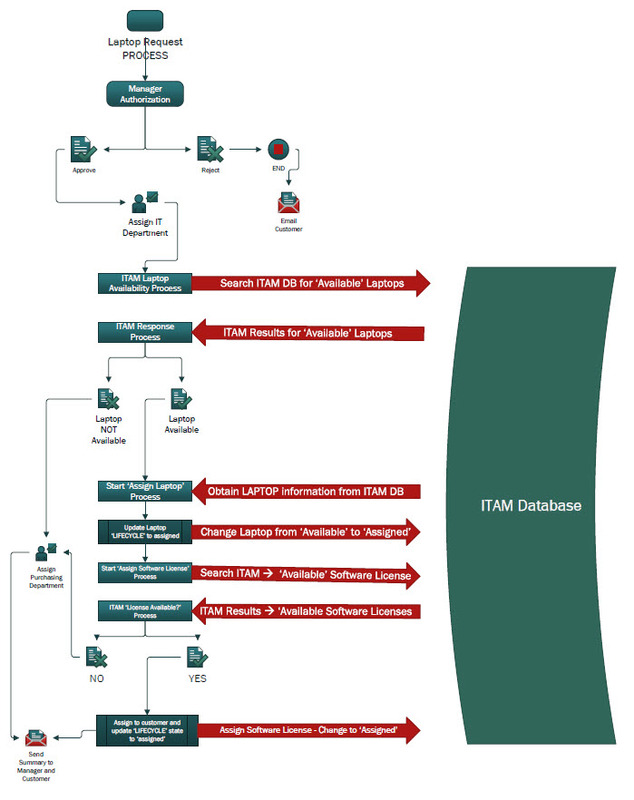 ITAM solutions manage the lifecycle of an asset. ITSM processes should be used to change the lifecycle of an asset in the ITAM database. For example, if a customer opens an incident due to a problem with his/her laptop, the analyst may initiate a process to request a replacement laptop for the customer. The problem laptop would then be given back to IT so that it can be fixed, replaced, or retired. To accurately track the problem laptop as it goes from the customer to back to IT, update the lifecycle state from the incident that was initially created to report the problem. 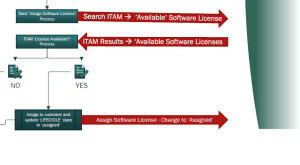 Today, integration can be built between ITAM and ITSM solutions through processes, connectors, and APIs. In the future, we will probably see more of a development platform approach for integrating ITAM into ITSM. This is a topic I hope to cover in an upcoming blog. There is no doubt that ITAM is relevant to effective IT service management. Companies that do not have an ITAM strategy alongside their ITSM strategy will spend more money over time than those companies who have integrated ITAM into their ITSM solutions. Previous PostFour Areas to Start Integrating ITAM into IT Service Management (ITSM) – Part 1 of 2Next PostARE YOU GETTING INSTANT GRATIFICATION FROM YOUR SERVICE DESK?